Since these guys never seem to rest, they have a couple of new Kickstarter projects looking to receive funding: Arq Dock 2 and PuGoo Mini. And both of them look killer. 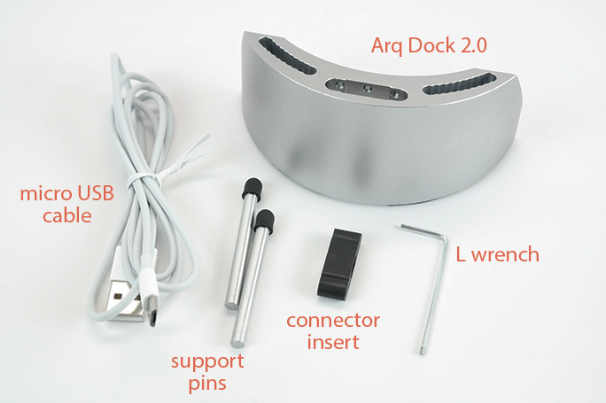 Arq Dock 2 is, as its name suggests, the successor to Arq Dock (which we went hands-on with back in March) and looks to make some improvements to the existing design. The most notable one is a larger slot for charging adapters, allowing both Samsung's USB 3.0 adapter and Apple's 30-pin to fit in the dock. Otherwise, it also has four cable channels on the back (as opposed to just two on the original Arq), as well as two more screw slots, which should accommodate a wider variety of chargers and positioning. All in all, it's a nice little update to the original, which I personally use on a daily basis. 2040 is seeking $12,000 for Arq 2.0, and it has already received over $9,000 with 27 days left to go. Head here to back this project. They were cool enough to give us some early samples of PuGoo Mini, and I've found it to be crazy-useful for a variety of things around the house. While PuGoo XL is great for larger things, I absolutely love PuGoo Mini for phones and holding things like my G Watch charger in place. 2040 is seeking $2,000 in funding for PuGoo Mini, and it's at $1,700 with 34 days to go at the time of writing. Get in on the action here.